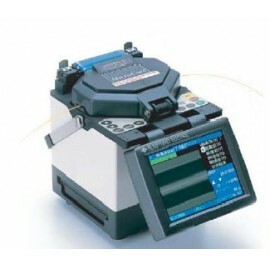 The Type-37SE Micro-CoreTM is a lightweight, portable, fully automatic, self-contained instrument for creating low-loss optical fiber splices. This full-featured splicer features a user-friendly software package with on-screen operation instructions that help simplify training requirements. It is highly portable at only 9.0 lbs and can receive power via an internal AC power module or internal 12V DC battery module. The splicer automatically aligns a pair of optical fibers in both the X and Y (horizontal and vertical) planes and then fuses them together with heat from an electric arc to form a low-loss splice. HDCM (High-resolution Direct Core Monitoring) image processing software in the splicer is used to perform core alignment and estimates the splice loss. The operation can be performed in as little as 11 seconds with a typical splice loss of 0.02 decibels(dB) for identical single-mode fibers.